Published books from Cynthia Lamanna and Jaylan Salman! One of our contributors, the Egyptian poet and aspiring novelist Jaylan Salman, has a book published by the MediTheater foundation – a collection of poetry entitled Angel of Darkness. Highly recommended, 47 pp., reasonable price. Jaylan pulls off wonderful work with imagery to express themes such as women’s worldwide quest for independence, international cultural interchange, and awareness/celebration of every moment. We’ve published several selections of her poetry, please feel free to search her name from the front page. Just click the image of the book to order – PayPal and credit cards accepted, $3.33 in euros, $4.75 USD. The page is in Italian but you may enter your PayPal password and user ID as you would with any other page. Also, Cynthia Lamanna, who sends in descriptive essays and short stories every now and then, has a children’s story out now with X-Libris, entitled Miriam’s Treasure. The book concerns a friendship between two elementary school girls, one Catholic and one Jewish, and how they learn about each other’s traditions. I believe it takes place several decades ago, in California. Whole Earth Festival 2010 — From the Ground UP! by MONDAY, FEBRUARY 8TH!! !The artist with the chosen poster will win $100 and major bragging rights! So many of the on-going issues this year are rooted in the larger problem of a top-down bureaucratic system. The budget crisis is being disproportionately passed on to already struggling students and faculty, while upper-level administration continues to splurge on their exorbitant salaries and CA congress does not seem to view public education as a priority. One of the few low-income student housing options on campus, the Davis Student Co-op at the Tri-Cooperatives, is facing closure due to a top-down “business” decision. Our environment is in crisis, we are faced with the impending consequences of global climate change, and yet our country’s leaders continue to support troop increases and an endless budget for costly and unnecessary wars. It is time to build our community, our university, and our world From the Ground on UP by striving for solidarity!!! Kate Leffler, artist and bullfighter featured in October’s issue, will show some of her latest work in a group show, Sunday, January 31st, from 11 am to 6pm (drop-in) at the Bakery Lofts, 4600 Adeline Street, Emeryville. Check out the flyer above to see some examples of her work and of her fellow exhibiting artists! 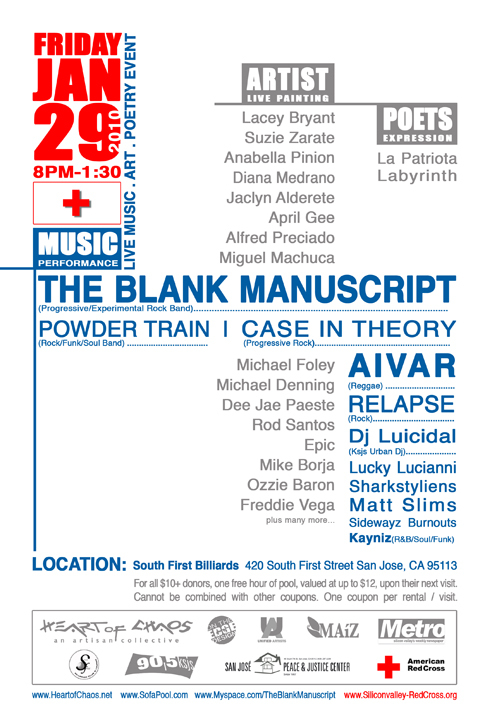 Opportunities for writers: prose from economists, social media mentorship, donate visual art/live music for a good cause! Jacquelyn Neubaur is co-organizing the Social Awareness Fashion Film Festival, where emerging filmmakers will present documentaries they have produced which raise awareness concerning various social and ecological issues local to San Francisco. The event hopes to raise funds for local grassroots organizations and to provide exposure for the emerging documentarians. They’re expecting the event to take place sometime this coming October and have put out the call for volunteer musicians who would like to perform live, artists who’d like to send prints of their work for possible display, fashion designers and models, etc. Goal is to draw folks in with all types of entertainment, then get them to watch the videos, learn about social issues, and then donate/volunteer for worthy local causes. Neubaur’s group eventually wants to broaden their focus to encompass the rest of the world, but is starting small and just working with San Francisco right now. They’re also interested in hearing from grassroots groups in SF which are addressing local issues, and possibly from filmmakers, although Neubaur has connections in the film industry. 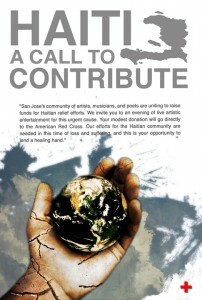 San Jose paint-in and live sale for Haiti relief, all welcome! Come to paint and sell, come to view and purchase! Friday, January 29th, South First Street Billiards, 420 First Street, San Jose, CA. If you would like to paint, please bring your own canvas and paints and arrive at 7:30 – for everyone else, this 21+ event starts at eight! 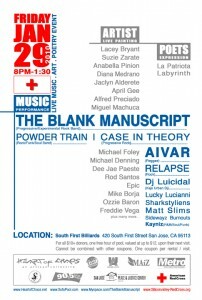 Live Music, Live Painting, Live Relief! Hello, and welcome to February’s issue of Synchronized Chaos! This month the theme is incarnation, or re-incarnation: personalizing, embodying, entering into another’s life and experience. Victory-Girl, a company creating vintage military-history and airplane nosecone art, helps pilots, history buffs, and others to personalize and develop a relationship with their planes. As with American art-car and classic-car culture, the planes (or jackets, bags, etc) which Victory Girl adorns become more than transportation machines, but almost living beings, interacting with the pilots. Cynthia Lamanna’s elegant piece on Valentine’s Day and the month of February brings older-style vintage writing and a nostalgic conception of the holiday back into today’s consciousness. Return of the spring to the Northern Hemisphere represents a form of physical re-incarnation, re-inhabiting the Earth after a long colder winter. Frank Allred’s new film Beat Angel presents the physical reincarnation of Jack Kerouac, come back to inspire a crowd at a poetry slam. Yet, through the imagery and dialogue, the movie brings his resurrection beyond a mere fantastical thought experiment and shows how it illustrates and symbolizes the larger process of creative people’s building off of each other’s work over time. Owen Geronimo also describes the cumulative process of artistic influence during our interview with him concerning factors contributing to San Francisco’s fashion resurgence. He speaks of San Francisco’s cultural mystique over the centuries as a place of innovation and discovery – from the Gold Rush to the hippie to the information-technology days. Still, for Geronimo and others within the San Francisco Fashion and Merchants’ Alliance, style can be affected by where one lives, but ultimately becomes a matter of personal confidence and choice. Empathy also involves individual choice, and represents one of the best ways we here on Earth can actually enter into another’s situation and state of mind. Tony Long illustrates what happens when people choose against empathy, or simply stay so preoccupied with themselves that they don’t use their capacity to understand others, in his humorous short piece “Leaving So Soon?” In contrast, Patsy Ledbetter illustrates empathy in action during her vignettes: imagining herself in the place of a homeless woman, which brings her to a place of gratitude, and sharing health information with others. Empathy represents an intellectual and emotional challenge and can bring great rewards during our social interactions – yet becomes a difficult task in modern city life, when we are surrounded by literally thousands of very different people. Connie Noyes illustrates these feelings through her mixed-media collages, where various colors and materials blend into one another throughout the collection, entitled, “Human Steps.” Yet, Noyes finds beauty and poetry in the assortment of imperfect interactions – and uses ordinary materials, even ‘garbage’ about to be thrown away, to constitute her collections. Perhaps, to Noyes, ordinary people, like ordinary materials, can find the strength and heart to attempt empathy, and thus ‘incarnate’ themselves temporarily as someone else. Richard Ghia-Wilberforce and Noel Dawkins philosophically explore the experience of multiple minds within one body, whether and how the human mind and brain can generate multiple, distinct individuals. Rather than describing this phenomenon as a mental illness, they examine a different way which some people experience ‘incarnation,’ or sentience, consciousness, the capacity for self-reflection. Finn Gardiner’s poetry mimics the rhythm of conversation, presenting a cafe as a unit of social organization, an organism in itself, coming into being through simultaneous, spontaneous interactions. Separate-bodied humans make up the cafe, but the piece echoes Ghia-Wilberforce and Dawkins’ ideas about what constitutes consciousness and existence, in a more poetic, abstract format. David Selsky attempts to set up a self-organizing system through his photography, snapping spontaneous scenes which attract his eye. To Selsky, intentionally ‘composing’ a picture might actually detract from what is really happening subconsciously behind the scenes. As with Gardiner’s self-organizing cafe, the theme comes into being without conscious direction – yet, merely because Selsky does not define the collection’s theme or even know what it is beforehand, he does not turn towards nihilism and assume that no unifying theme can, or does, exist. Perhaps the search for meaning can itself become a source of meaning, can represent our current best efforts towards finding whatever is out there. Through that search, we, like the Beat writers, can leave ideas behind which become ‘reincarnated’ philosophically into subsequent generations, who then continue and proceed with our search. Please feel free to search for meaning within the posts of this month’s issue of Synchronized Chaos – Happy Valentine’s Day to those who celebrate. With a grainy, indie, half-lit café feel, with brass sounds more akin to instruments tuning up than a jazz performance, the new film Beat Angel reflects the restless, transcendent creativity of Jack Kerouac and other Beatniks. Desperate to reach a discouraged author, Kerouac returns from the dead for one day, performing at a poetry slam in his honor and befriending amazed, but skeptical audience members. Balestri embodies Kerouac throughout the film, most effectively during a highly energetic open mic performance, holding my interest for its entire ten minutes. Defining ‘spontaneous poetry’ via spoken word examples, Balestri relates aspects of the Beat aesthetic: the use of jazz rhythms, recognizing and speaking the truth about our common humanity, and reworking the travel memoir genre. Sometimes slow and academic, other times fast and musical for illustrative purposes, his presentation covers a great variety of intellectual and emotional ground. Beat Angel celebrates its protagonists’ creativity without smoothing over the darker aspects of their lives. The film’s most complex character, Gerard Tripp, slams Kerouac and other Beats as troubled, overrated drunks. And the movie opens with Kerouac dying alone, curtains drawn in his mother’s living room, with only whiskey and old cooking shows for comfort. The instrumental sounds follow the characters, sometimes even as they sit alone, giving the sense that something happens within their heads that only they hear, or perhaps choose to hear. The disjointed background noise during certain scenes – Kerouac’s death, and his memory of his brother’s illness and passing – is isolating, restless, even more jarring than silence. Perhaps the film suggests here that some of the Beats did not choose the writing life so much as turn to writing and other arts to quiet and satisfy the inner voices, the questions and contradictions inherent in their lives and times. Gerard, bitter over his lack of commercial success as a writer, lives in a dingy apartment and hides unsubmitted manuscripts away in a trunk. In one of the film’s most poignant gestures, the reincarnated Kerouac inspires not through his posthumous fame and success, but through how he sought beauty and meaning through his times of personal loss and weakness. In a lengthy dream sequence, Kerouac and Gerard remember Kerouac’s brother, who passed away at a young age. The candle and church/funerary imagery suggest that Gerard abandoning his writing would represent another form of death, whether or not he ever lands a book contract. Others draw strength from Kerouac during his one-day stint on Earth, including a shy, beginning writer and the bartender, who once aspired to become a painter. Amy Humphrey brings genuine openness to personal and artistic growth to her role, illustrated by how she thinks through his advice. I was left wishing for a little more backstory and complexity for her character: what did she write, why was she drawn to Kerouac and the Beats, etc – although I appreciate her performance. Lisa Niemi pulls off her part as a grown career woman with a past of unexplored dreams, illustrating how people in all stages of life can benefit from mentorship and inspiration: beginners, the hardworking but discouraged, and even those who have let go of old aspirations. Beat Angel avoids adding to the personality-cult around Jack Kerouac and instead celebrates writing and art in themselves. Kerouac himself scans Gerard’s bookshelf, pointing out how everyone learns from others, and how he studied Whitman, Emerson, and other older authors. And his final message to Gerard is not to write more like Kerouac, but to pursue and develop his own style and craft. Only an hour and a half, Beat Angel is a short film, and some of its characters’ stories could be expanded. Overall, the piece is very thoughtful, evocative, and reflective of the experimental artistic work of the Beat writers. People can understand and enjoy Beat Angel even without knowing much about the period’s writers, and the film explains basic ideas in an entertaining enough style to make the film accessible and enjoyable.